Fri., June 10, 2011, 8:10 p.m.
VANCOUVER, British Columbia — With a fortunate bounce and a flawless goalie, the Vancouver Canucks are heading back to Boston with the chance to hoist the Stanley Cup for the first time. Maxim Lapierre scored on a carom off the back boards with 15:25 to play, Roberto Luongo stopped 31 shots in a stirring shutout after getting pulled from his last game, and the Canucks moved to the brink of their first NHL championship with a 1-0 victory over Boston in Game 5 on Friday night, taking a 3-2 series lead. Luongo posted his fourth shutout of the playoffs and second of the Stanley Cup finals after giving up 12 goals in less than four periods during two blowout losses in Boston. The Canucks have scored just six goals in five Stanley Cup finals games against brilliant Boston goalie Tim Thomas, yet they’re one victory away from winning it all. Neither team found an offensive flow in a Game 5 nail-biter, but Luongo kept Vancouver in it until Lapierre and defenseman Kevin Bieksa teamed up on a goal that set off a crazy celebration among tens of thousands of fans thronging downtown Vancouver. After two scoreless periods of stellar goaltending in which Boston went scoreless on four power plays, the Canucks finally connected with a supremely heady play by the veteran Bieksa, who used Thomas’ aggressive style against him. Bieksa deliberately put a long shot wide of the goal, and when Thomas instinctively moved to his glove side to play it, the puck ricocheted off the back boards straight to Lapierre, who put it behind Thomas for just his second goal of the postseason. 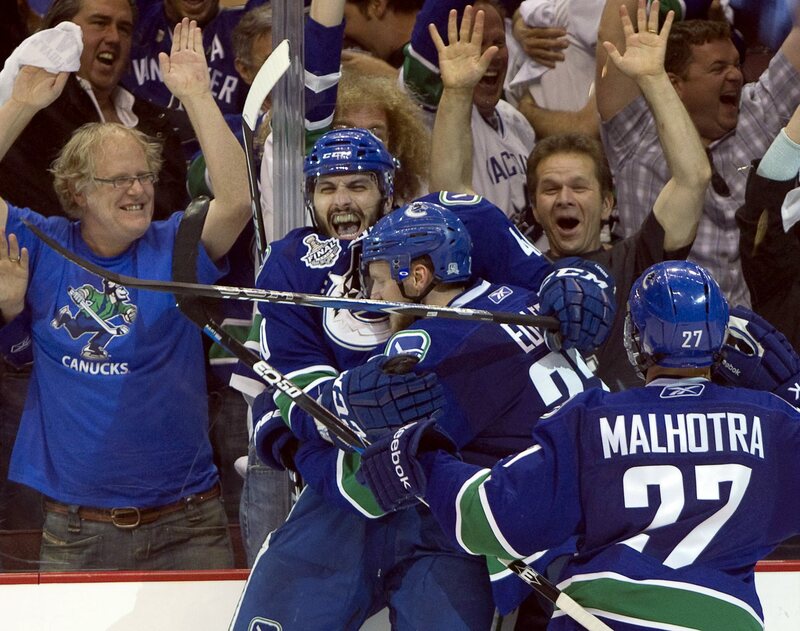 The Canucks hung on from there, winning their sixth straight home playoff game since May 7. Published: June 10, 2011, 8:10 p.m.